Politics, Theater, Performance Studies, Technology. America’s foremost anti-surveillance camera group documents its scripts, performances, maps and walking tours, and offers analyses of the right to privacy, the militarization of the police, the ideology of transparency, the mass psychology of fascism, the society of the spectacle, the PATRIOT Act, Rudy Giuliani, September 11th, face recognition software, reality TV, webcams and wireless systems, among other topics. “The Surveillance Camera Players have made an important contribution to our understanding of our transformation into a surveillance society. The extensive documentation and analysis of the exponential increase in video surveillance in the heart of New York City should spark a public policy debate and reform that is long overdue.” — Donna Lieberman, New York Civil Liberties Union. “This long overdue book chronicles the imaginative and intelligent work of one of the most important performance groups of the last 20 years.” — Dr. Kimberly Paice, Assistant Professor of Contemporary Art, University of Cincinnati. “This book is an inspiration for those despairing of the dearth of creative political dissent in today’s world.” — Clara Gibson Maxwell, dancer/choreographer. 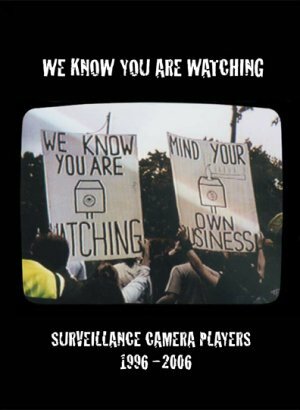 “The Surveillance Camera Players are not watching you. They are watching the cameras, because we have forgotten to. The cameras can’t understand what the SCP are doing, but we can. The cameras don’t smile but you might.” — Greil Marcus, author of Lipstick Traces.